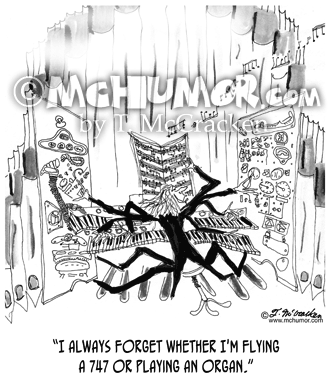 Audio Cartoon 7572: In front of a sound mixer with hundreds of knobs sits a space alien with 10 fingers on each hand. 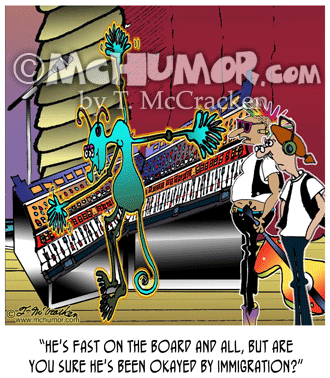 A sound engineers says, "He's fast on the board and all, but are you sure he's been Okayed by immigration?" 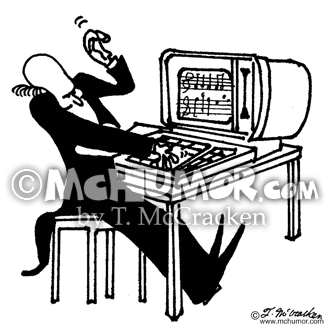 Piano Cartoon 3655: A pianist in white tie and tails dramatically plays a computer key board while music dances across the screen. 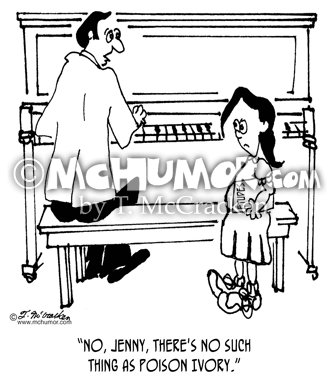 Piano Cartoon 5759: A music teacher says to a kid, "No, Jenny, there's no such thing as Poison Ivory." 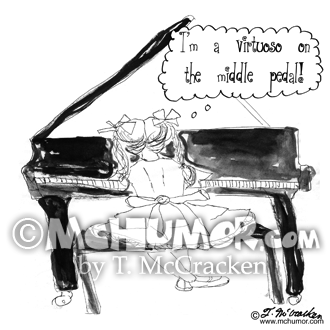 Piano Cartoon 9016: A little girl playing the piano thinks, "I'm a virtuoso on the middle pedal." 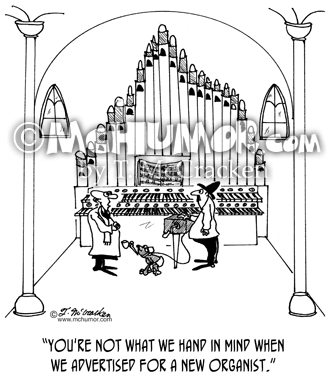 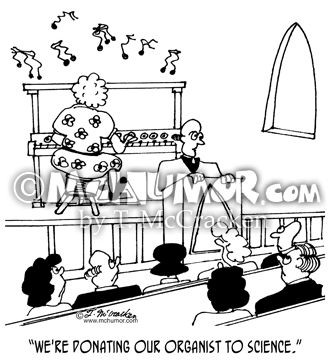 Organ Cartoon 4230: A pastor says to the congregation, "We're donating our organist to science." 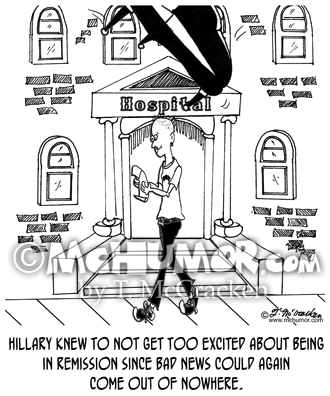 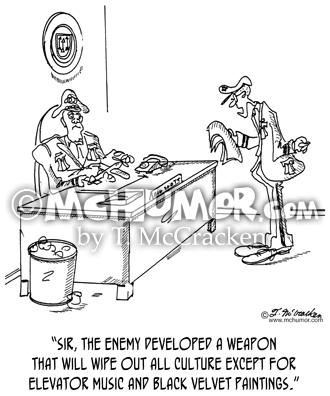 Culture Cartoon 2807: A soldier says to a general, "Sir, the enemy developed a weapon that will wipe out all culture except for elevator music and black velvet paintings." 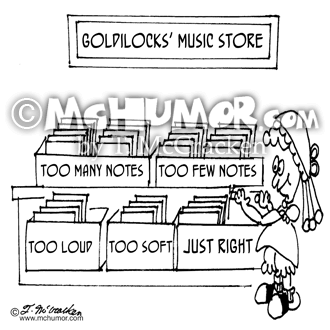 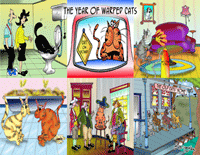 Music Cartoon 6033: At the Goldilocks Music Store albums are labeled: "Too Many Notes," "Too Few Notes," "Too loud," "Too Soft," and "Just Right."